Your back can be hurting you for many reasons. 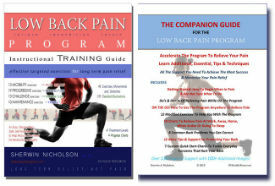 But what is common with almost all back problems is tightness. If you find it very hard to straighten up easily after you’ve been sitting or lying, that’s a good sign you are tight and you can begin to fix it now. Before you begin, try this out for a second (cheek test coming). Stand up straight right now (and without using your arms), try to turn and look at both of your rear pant pockets? How easy was that? If you can’t or it hurts to do so, you’ve found your problem. This above move requires for you to rotate almost every part of your spine actively. If you are having serious issues with your flexibility, then your lumbar region will be the first to wear, become stiff and keep you from rotating properly. Lumbar pain is caused by many risky (and potentially harmful) movements that we do using our backs. The simplest movement begins with sitting. If your discomfort has become chronic and is no longer temporary, you most likely experience stiffness, tightness and very poor flexibility in this lower area of your spine. Part of the reason is because your body wants to remain stiff by ‘muscle guarding’. Guarding removes your ability to twist, lean or bend. This ‘rigidity’ also prevents your lower intra-spinal muscles from relaxing, preventing much needed expansion and rehydration of your discs. Once your back has recovered from injury and you feel it is safe to twist, you can try this exercise. This will help restore some much-needed movement and relieve pressure on the spine. The twist that you will learn should not be forced. It should only be performed according to your level of comfort. Caution: If you have hypermobility issues or severe vertebral issues such as spondylolysis, be very careful or get consent from your doctor for any exercises that encourage twisting. The Lying Twist below is one of those movements you need to practice when long periods of sitting are necessary or if you suffer from back spasms. This movement is only one of many to relieve lumbar pain. Remember, no single exercise can solve all of your pain. You’ll need to practice many separate movements for it to work for you. The Lying Twist is #10 of the Limited Mobility Exercises in the Program. 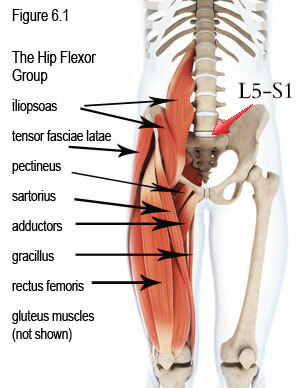 Stretch your psoas muscle ( a common area for lumbar pain). Stretch your lower back muscles (increases mobility, flexibility, reduces tightness, improves instraspinal muscle mobility). Strengthen and condition your muscles (upper and lower to help maintain a neutral spine, reduces spasms). Stretch your glute muscles (improves hip mobility, reduces hip pain, improves pelvic tilt). Because extended sitting is going to cause lumbar pain, it is important to LIMIT the amount of time sitting and to take breaks from extended sitting (every 25-30 minutes for 1-2 minutes). Standing or walking is a must. 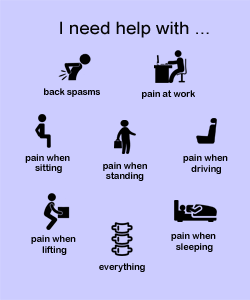 Sitting is NEVER healthy for your lower back. 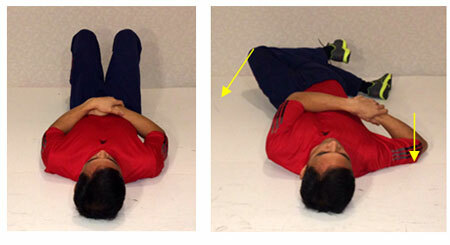 Step 1: Lie on the floor (or bed) with your knees bent and feet on the floor. Hold your hands together. Twisting should be done often but very slowly. It takes time for the stiffness to release. Step 2: Cross your legs and slowly relax over to the side. The leg on top should lean both legs to its own side. Place your elbow on the opposite side for support to keep the back on the floor. Note: If you are super tight (can barely see your rear pant pocket), then don’t bother to cross your legs. Just let both fall together to the side. Allow both gravity and time to help you with this twist. Step 3: Relax. Hold this position for 30 seconds to 2 minutes. Note: For the super tight again, just hold for a few seconds (5-10). Add more time when later when you’re more comfortable. Note: You will stretch very tight and resistant muscles. You may feel sore afterwards as tight, and weak muscles will be lengthened more than usual. Allow time to recover. This stretch requires time to become effective as the lowest muscles on the spine and lower back are difficult to mobilize from over tightness. Tip: Let gravity do the work. To strengthen the muscles stretched, slowly bring your folded legs up to the original position without assistance. In the first 10-30 seconds, your initial stiffness may prevent you from fully feeling the benefit. Deep relaxing breaths and patience are key to holding this position. This Twist can be easily done immediately upon waking or going to bed. If you are tired of hurting and are in need of a proven, structured, plan for relief: Search this site for more valuable help and download the program. It includes this Twist along with all of the others you need to help you release your tension.